This program seeks to educate students in the larger community about the importance of wilderness and nature. With a focus on environmental thinking, writing, conservation, and wilderness travel, the program is intended to create opportunities for NYA students, high school students across Maine, and the larger community to acknowledge the importance of wilderness conservation and environmental issues. The Kauffmann Program is aligned with NYA’s mission to develop a “concern for the larger community and appreciation for the natural environment.” The program seeks to preserve and extend the legacy of former NYA trustee John M. Kauffmann, a neighbor and friend of NYA who had a lifelong passion for public lands and wilderness conservation. 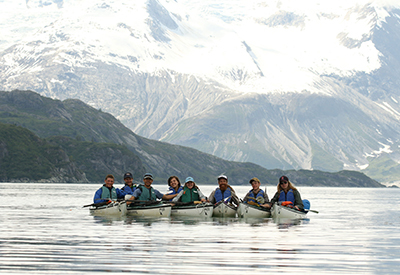 Programs such as the NYA Outing Club, Glacier Bay Environmental Writing Course, Environmental Writing Seminar, Kauffmann Prize for Environmental Writing, Middle School Leadership Academy, and the Sea Kayak Academy are all part of the Kauffmann Program. NYA also offers a Diploma with Distinction in Outdoor & Environmental Leadership and an elective class entitled “Brain Training & Resilience” as part of the Kauffmann Program. The NYA Leadership Academy is a program where NYA Middle School students spend five days hiking across the high peaks wilderness of New Hampshire’s White Mountains. It is open to rising seventh and eighth grade students at NYA. Students should be physically and mentally capable of hiking for four strenuous days in the mountains. Over five days, students learn about, and practice, leadership. Students work together as a team to cross some of the most challenging and beautiful terrain in America. The group stays at the Appalachian Mountain Club’s high mountain huts, above tree line, and learns about the unique history and ecology of the White Mountains. Each student will have a chance to lead the group, and to take on different responsibilities. Through individual conversations, daily journaling, group conversations, and facing challenges, students will learn about their own individual leadership styles and will leave the program with improved self-knowledge and goals that they will apply to the coming school year. This is not merely a fun hiking trip (though it is that also! ), but is also a laboratory for students to develop personal grit and leadership skills. The 2019 NYA Leadership Academy will take place on August 12 through 16. Students may apply up to April 15. More information and an application.